Now on in our exhibition space on the second floor of the Central Library is House and home: domestic life in New Zealand. This nostalgic exhibition, which will run until 30 October, explores the domestic side of New Zealand life before the 1980s. It looks at what made a house a home in New Zealand. Today we’re looking at entertainment in the home. 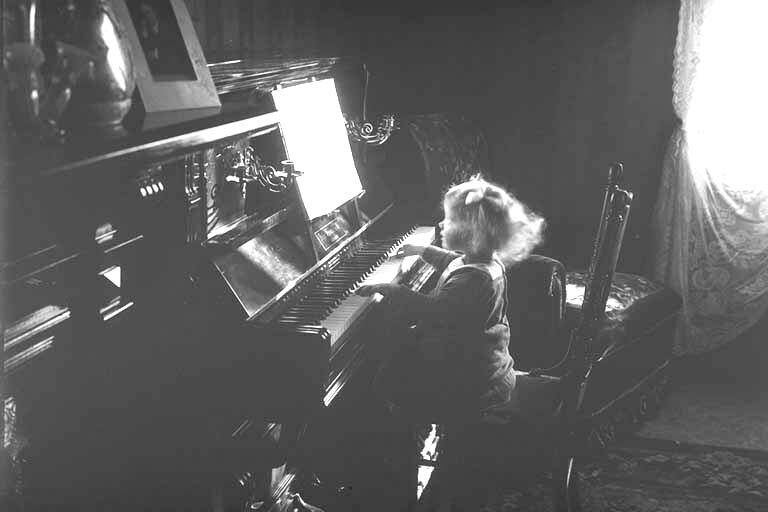 Ref: James D Richardson, Jean Richardson sitting on cushion on chair, playing the piano, 1915?, Sir George Grey Special Collections, Auckland Libraries, 4-8902. Prior to gramophones, radio, televisions and computers, pianos were, for many homes, the home entertainment centre. From the 1860s to 1916 they were New Zealand’s biggest luxury import. Sheet music was collected as avidly as records and CDs were later. 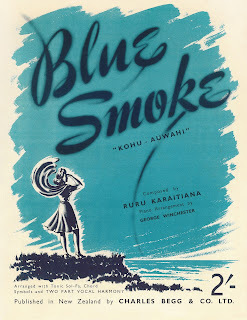 Ref: Blue smoke = Kohu-auwahi / composed by Ruru Karaitiana ; piano arrangement by George Winchester, c1947, C. Begg, Sir George Grey Special Collections, Auckland Libraries, 784.062 KAR. The first radio broadcast in New Zealand was made in 1921. By 1922 there were 572 listening licences issued, increasing to 71,000 by 1931. In 1932 the government decided to establish the New Zealand Broadcasting Board and as a result radio broadcasting became a state enterprise. Crystal radio sets were the first widely used type of radio receiver. With very few parts, they needed no batteries or other power source, and could be built out of things found around the house. In early receivers, the detector was a ‘cat’s whisker’ that comprised a fine metal wire on an adjustable arm that touched a semi-conducting mineral (the crystal). The operator dragged the wire across the crystal surface until a radio station or static sounds were heard in the earphones. Sold and homemade by the millions, these inexpensive and reliable sets were a prior driving force in the introduction of radio to the public. Ref: Samuel G Firth, Robert Emirali and his teddy listening to a crystal set, 1928, Sir George Grey Special Collections, Auckland Libraries, 1043-9712. “Everyone was terribly excited over our crystal sets. I can see my father at night now. 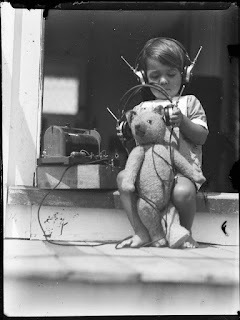 We had only one pair of earphones in the whole family, and he’d sit there – prick, prick, prick – all night, and then he’d lose it and there’d be some swear words and so on – and we’d beg him to let us listen, so he’d lend us half an earphone and he’d have one clasped to his ear (Edna Gyde in Voices in the air, Peter Downes & Peter Harcourt, 1976)." 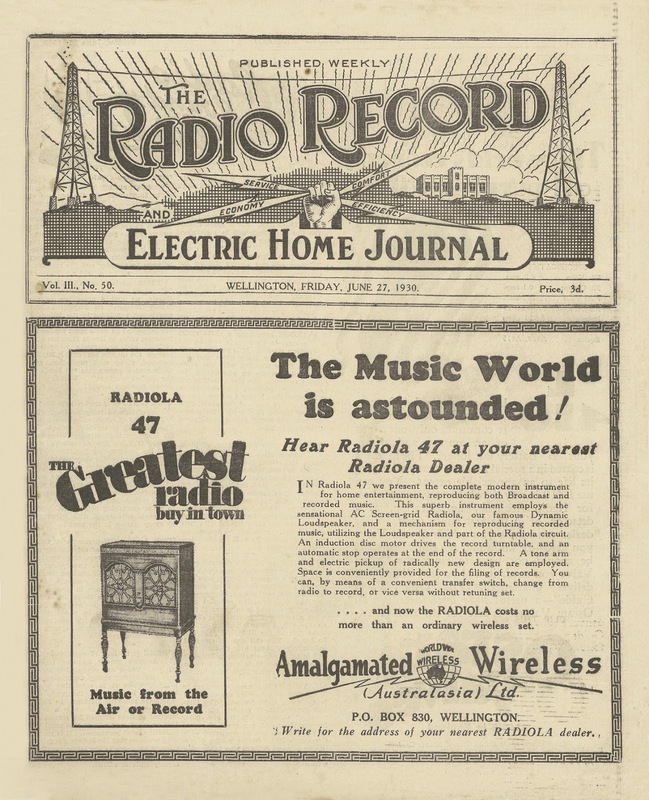 Ref: The radio record, 27 June 1930, Central Auckland Research Centre, Auckland Libraries, A+H SERIAL 791.44 R12. 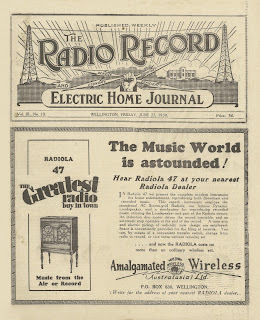 Pictured above is The New Zealand Radio Record which was superseded by the New Zealand Listener. Radio serials were at first described as ‘undesirable’ but they soon became some of the most popular radio content. In a 1947 educational research paper W. J. Scott listed the results of a survey of high school pupils’ favourite radio serials. The top ten included Dad and Dave, On His Majesty’s Service, The Phantom Drummer, The House of Peter MacGregor, Strange Experiences, Jimmy Allen, Piccadilly, Easy Aces, Jezebel’s Daughter, and Tradesman’s Entrance. Ref: Ron Clark, Christmas at Taipakupaku?, 25 December 1966, Sir George Grey Special Collections, Auckland Libraries, 1207-1850. 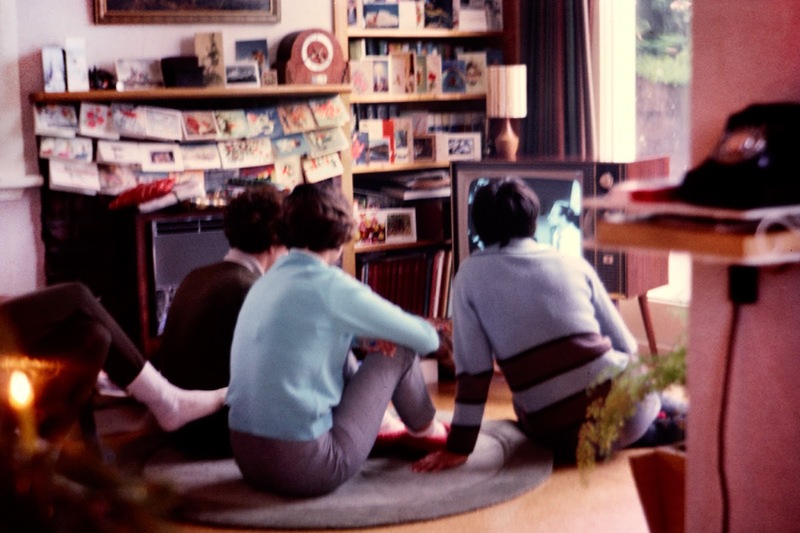 New Zealand's first official television broadcast was made in 1960. No other country bought televisions at the rate New Zealanders did. By 1972, 96 percent of all homes that could receive a television signal had a television set. For its first 14 years, New Zealand television was a black and white world. On the 31 October 1973 colour television was introduced in readiness for the 1974 Christchurch Commonwealth Games. The first Telethon fundraiser was held in 1975, launching a second network channel (TV2). In 1989 TV3 became the first privately owned station, followed a year later by SKY Network Television which became the first pay television network.